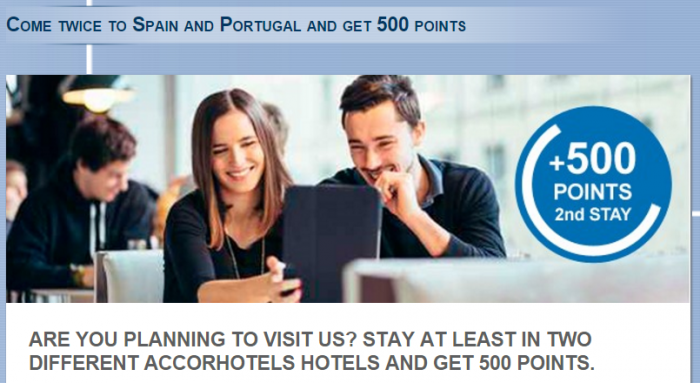 Le Club AccorHotels has launched a new promotion for stays in Spain & Portugal between January 11 – March 17, 2016. You can earn 500 bonus points by staying at two different hotels and having booked them January 11 – March 11. This offer requires registration. You can access and register this offer on Accor’s website here. Note that this offer doesn’t require you to book any other than a points qualifying rate to earn the bonus points. Should be easy 500 bonus points for those that have stays coming up n Spain or Portugal this winter. 1. General Le Club AccorHotels terms and conditions apply to the Repeaters offer and you must be Le Club AccorHotels member to benefit from it. 2. This offer entitles Le Club AccorHotels members, regardless of their status, to benefit from earning 500 bonus point for the second stay in one of the participating hotels in Le Club AccorHotels Loyalty program. This promotion is not applicable for hotels partners of Le Club AccorHotels.The number of bonus points for this offer is calculated according to the points earned by the member based on Classic status. 3. This offer is valid for a member’s stay from 11/01/2016 to 17/03/2016 in one of the participating hotels in Spain and Portugal, and booked between 11/01/2016 and 11/03/2016. 5. Any consecutive stays (check-out and check-in same day) in the same hotel, will be considered as a single stay. This single stay will be eligible once to the Repeaters offer. You must register for the Repeaters offer before proceeding to the booking, to be eligible to the offer.